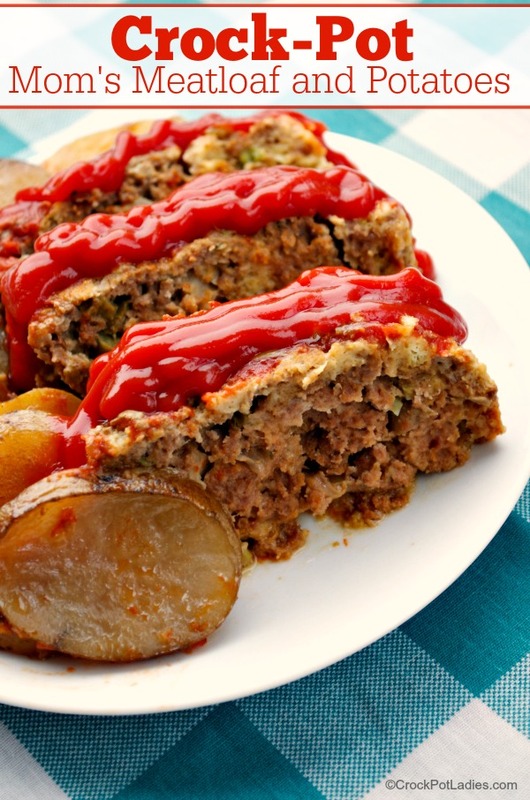 Only 9 ingredients needed in this classic recipe for Crock-Pot Mom’s Meatloaf and Potatoes! 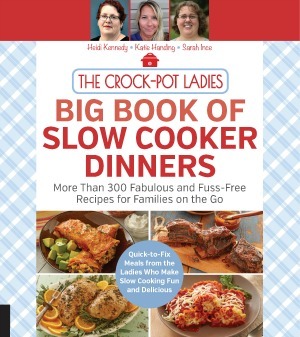 A complete slow cooker dinner! I really love a good meatloaf even though it is not something we cook very often. But when I do make meatloaf everyone in the family loves it. And then I remember just how very good meatloaf is and vow to put it on our meal plan more often. 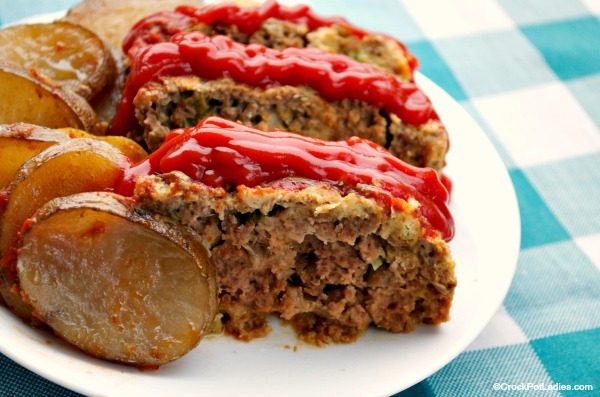 This meatloaf recipe is very easy and only requires 9 ingredients. To make it more of a complete meal I added potatoes to the slow cooker that cook while the meatloaf cooks. A side salad really rounds out the meal but serve whatever green veggies your family likes. Lean ground chuck is what I like to use in my meatloaf, not only for health reasons but because there is less fat that cooks off your meatloaf in the slow cooker. You can also use ground turkey or chicken in this recipe too if you want to. 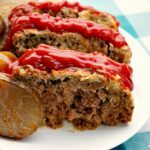 A combination of beef and turkey can make a very flavorful meatloaf that is a little bit lighter in calories. The rest of the ingredients are pretty simple. Egg, milk, bread (use gluten free bread if you are on a GF diet), adobo seasoning (store bought or our Homemade Adobo Seasoning Mix recipe), onion, bell pepper, and ketchup for the topping. The only thing you need to keep in mind while making this recipe is to make sure not to add too many potatoes. 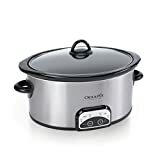 If you slow cooker is more than 75% full then whatever food is near the top of the slow cooker isn’t going to cook very well. A simple 9 ingredient recipe for tasty meatloaf just like mom used to make. Potatoes are cooked right in the slow cooker with the meatloaf and come out perfect! Spray a 6 quart or larger slow cooker with non-stick cooking spray to prevent sticking. Cut two rings from the bell pepper and dice the rest. In a large bowl, mix egg, milk, seasoning and bread crumbs. Let bread crumbs get moist. Add ground chuck, onion and diced pepper. Shape into loaf in crock-pot. Add the two pepper rings on top and potatoes around sides of loaf. Top with ketchup (use however much you like). This recipe was first published in February 2012. And we have decided it was time for an update. New photos, as well as special diet and nutritional information has been added. We hope you enjoy!